This smoothie recipe is one of Kristen's all-time favorites. It's simple to make and delicious! in your Vitamix or blender until smooth. That's all there is to it! P.S. We ALWAYS buy extra bananas! When the skin starts to darken and they are too ripe too eat, we just peel them, break in half and freeze. This recipe is a homemade version of Lara Bars, a healthy, whole food nutrition bar that can be found in your local grocery store. If you're not into making your own, by all means, buy theirs. We think they are the best bars out there. However, if you're adventurous, try making your own! Ours are named Twiddle Bars because Judd has always called our daughter Briana "Twiddlebug", and she is the one who suggested the idea to make a homemade Lara Bar. We use our Vitamix to make these; if you don't own one, you should be able to use your food processor to make them. Feel free to experiment with your choice of ingredients, but remember to always use pitted dates as the base ingredient, as they are what gives the bar its consistency and holds it together. Check out the Lara Bar Website for different flavor options to try out. Blend Dates & Raisins in food processor until it has a paste-like consistency, using the "pulse" option on your machine if it has one. Here is a picture of our latest batch of Twiddle Bars. Our go-to recipe consists of just dates, raisins and sunflower seeds. Judd made this version by blending 1 1/3 cup of dates, 1/4 cup of raisins and 1/4 cup of Goji Berries, then hand mixing the blended ingredients with 1/4 cup of pepitos and 1/4 cup of sunflower seeds. You get the idea! This recipe makes 6-8 bars each containing 195 calories. We suggest eating one bar as a mid-meal snack. These aren't diet food, so while you may want to eat all 6 in one day, please don't!! Sesame Tahini is an all natural creamy puree of sesame seeds that has a light, nut-like flavor. 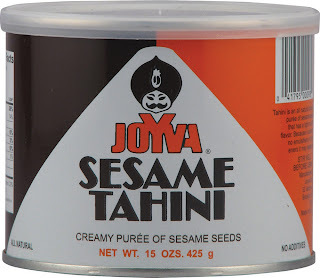 It is a common ingredient in Middle Eastern cooking. We love to use it when making Hummus.